Home » Unlabelled » Newest Trends for Hair & Makeup: Beauty.com shows us what is hot! 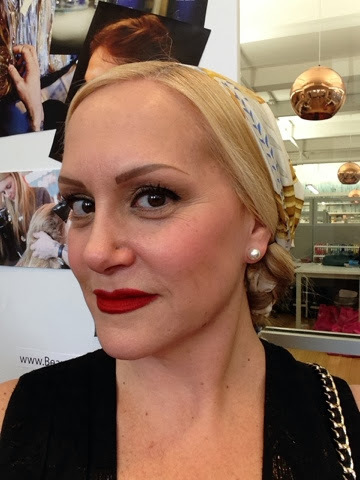 Newest Trends for Hair & Makeup: Beauty.com shows us what is hot! Both Romy Soleimani and James Pecis are two uber talents. 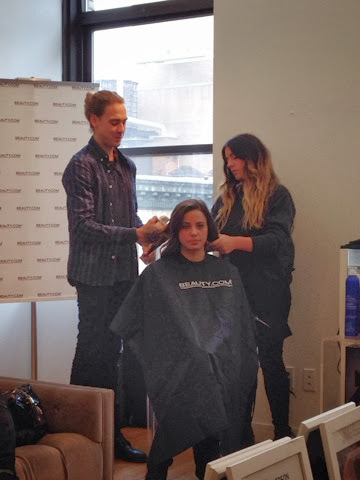 Beauty.com sponsored an event that allowed us to ask them to recreate looks we liked from some of our favorite NYFW shows. First, Romy used Kevin Aucoin beauty products and adhered glitter to the models eyes and cheeks as seen backstage at Lela Rose. Kevin's lip balm was used to keep the glitter in place! A moisturizer could be used as well, Romy added. Romy making the models brows more full with the Kevin Aucoin brow pencil ( I use brunette). Here Romy shows us a midnight navy eye- very sultry. 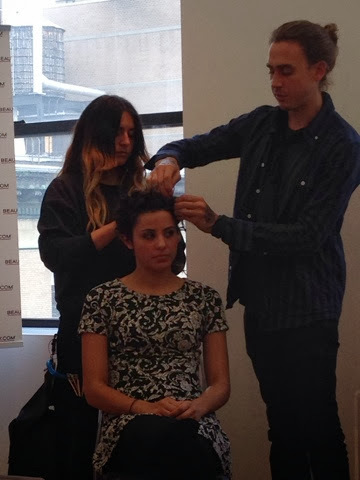 Then James recreated a truly knotted hair look similar to the Nanette Lepore hair seen backstage. James took sections and actually knotted each one and then after all were done, placed them tightly around the models head with hair pins. The look went from quite messy to sleek. 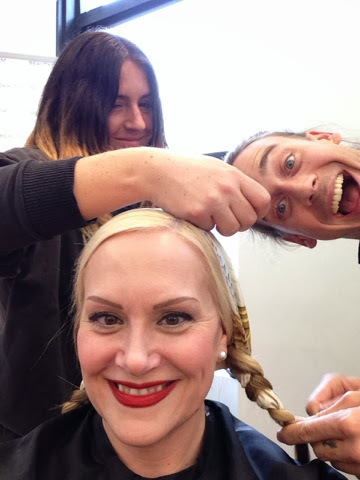 I volunteered to sit in his chair and sported the look from HONOR with scarf and two braids that were entwined in the back! Mousse from PHYTO was used to get my hair in a sleek side part and Alterna Haircare was used at a lot of the shows. Their Dry shampoo is among my personal favorites. Smells delightful! James photo bombed my selfie! Final look was quite chic! Top trends we saw in many shows were bold brows, eyes and lips. Messy braids and tight buns were also among the top trends spoken of. James and Romy are true artists that find creativity in all they do. Just look at their work....it speaks for itself. Products mentioned can be bought by visiting www.beauty.com.